Submission for Jam 7DRL 2019. 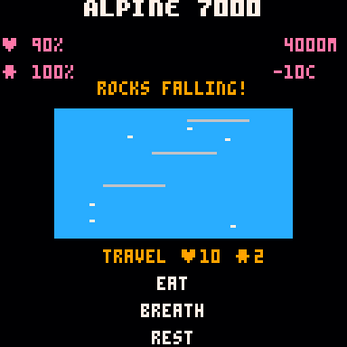 Play as a mountaineer, tries to ascent 7000m and stay alive. Nice music ;) Would be nice to know what exactly non-travel actions do. Anyway, I made it to 7000! I liked the idea and probably would enjoy a bigger game about mountain climbing which would be somewhat close to roguelike genre . Thank you! The original music is made by a metal band: https://www.youtube.com/watch?v=fnD8OHsllm4 They won a prize on wacken open air 2017. I plan to add a selectable route to it, and more types of rooms (now it's basically one type) with different random events. But I don't have a set schedule. Also they are influenced by altitude and random events.